The evening of October 13th, 2017 was one I won’t soon forget. Settling into my seat at the George Mason University Center for the Arts, the curtains were open so that our imaginations could run wild as we squirmed in our seats waiting for the show to start. From the ceiling hung clothing, picture frames, hula-hoops and other fixtures. My heart raced as I anticipated the lights dimming and the commencement of Shadowland, a show I have been waiting to see for years. I remember feeling inspired after watching a short version of Shadowland on TV sometime around 2011-2012. Until then, I had never seen anything like it before; a dance performed completely behind a screen, where the performers play with shapes and perspectives that bring mythical characters to life. 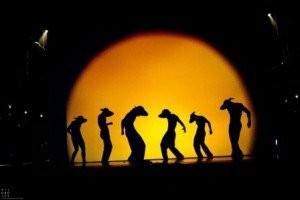 The members of the dance company, Pilobolus, manage to contort their bodies in ways that are stunningly captivating, even behind a screen in total silhouette. Pilobolus has always pushed the envelope when it comes to answering the question, “What is dance?” With a unique collaborative choreographic process, they are able to come up with ideas beyond the capabilities of one single mind. 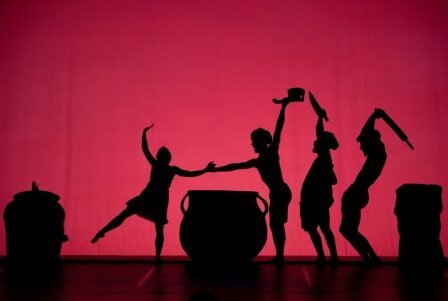 Shadowland was conceived by the dancers and directors of Pilobolus, along with Steven Banks (lead writer for SpongeBob SquarePants), and with original music by musician, producer and film composer David Poe. The storyline was simple: a young girl wants to fulfill her dreams of moving to the big city, except she gets turned into a dog humanoid by a giant hand that comes from the sky, and she faces adversity and treachery along the way. By the way, the story takes place in her dreams, after she dozes off on her bed made of men and is whisked away into the land of shadows. One of my favorite scenes is early on in the show, where the girl happens upon a large cauldron with legs. Comical, cartoony French chef music begins to play, and a trio of loony chefs start making a stew by throwing anything they can find into the cauldron. They toss in a shoe, a telephone, and the literal kitchen sink, until there is nothing left. They decide the final ingredient would be the girl, and a Scooby Doo-like chase ensues through long hallways to try to catch her. At one point our dog-faced main character is kidnapped by the circus. This is the only part of the show that got too weird for me. 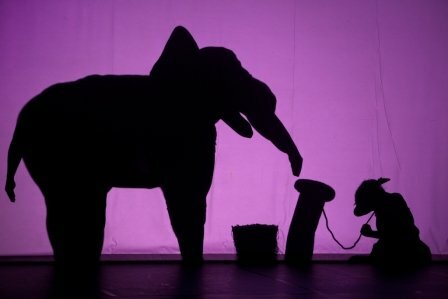 It was a bit dark and perverted, as circuses are, but I felt like the tone of this part of the show didn’t quite fit the rest of the story, which was silly and whimsical. Another part of the show that fascinated me was the scene by the water. The girl encountered (hand shadow) crabs, a gigantic seahorse, and even got swallowed by an enormous squid-like creature. The movement, slow and resistant, along with the lights and other effects, really gave the feeling that the entire stage was under water. What I really love about Pilobolus is their commitment to the bigger picture, that no one dancer steals the show. A great example of this is when the main girl is falling asleep and drifting off into her dreams. The men lifted her and undulated her body through invisible clouds, making her appear as if she were light as a feather, floating to the ground. It became so real, the men almost disappeared and it was like watching a cartoon character suspended in the air, spiraling into the fictional land of dreams and shadows. I was also impressed by the sheer beauty of it all. The performers are obviously doing things with their bodies that are incredibly difficult and impressive, even teetering on the line of being acrobatic. But it does not evoke the same response that you would have at Cirque Du Soleil. Their tricks do not warrant cheers and gasps, their stunts do not appear to be dangerous and exciting, there is no spectacle to behold, just soothing, effortless, beautiful movement. 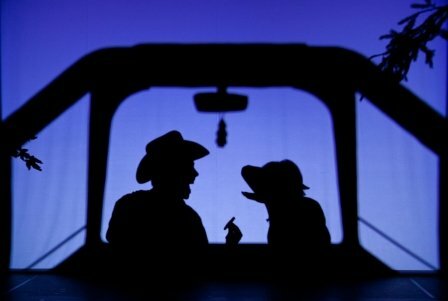 Even after touring Shadowland around the world for almost a decade, Pilobolus has a way of adapting to their specific crowd and keeping the viewers on their toes. I feel that this is a show I could watch over and over. In their encore of the evening’s performance they made several references to the Fairfax, Virginia area, including the local Silver Diner and the George Mason University campus. It insinuated that there will be yet another chapter to the story, and also left us feeling an affection for the performers who cared enough to tailor this experience just for us.